The e.l.f. eyeshadow quad is the first custom quad i've ever purchased and also the first eyeshadows i've tried from e.l.f. I've been wanting to put together my own palette for a while, specifically lusting over mac, but whilst i'm trying to save I decided a cheaper alternative was on the cards. I love the fact that you can put together just the colours you want, skipping out those few unused colours you get in pre made palettes. Now you may be thinking 'why has she bought 3 shadows for a 4 shadow quad'. Yes I realise it might seem quite ridiculous but honestly I was just looking for a few colours for a navy smokey eye and these were the only ones I needed. I wasn't sure which other one to choose and seeing as i'm saving, I may as well save a bit extra and fill that gap when I know what I want! So as I said, I was after a few colours for a navy smokey eye. I wanted to try a bit of colour without going too garish and thought navy would go well with my blue eyes. These three colours are exactly what I was looking for, a neutral colour, a dark navy and a charcoal grey. They're all shimmery which is just what I wanted, hence the night sky blog title. As for the quality of the shadows, the colour payoff is great and they do last a long time, bearing in mind I do use an eyelid primer. I would say they take a bit more blending than my naked palette or MUA palette but they are blendable. My main downside to this is the fall out, I have to be super careful with this, usually holding a finger under my eye to prevent fall out making me look like a panda. Overall, I can work with the downsides and it gives me the look i'm after which lasts all day/night. I have been wearing this on all my nights out recently with a bit of eyeliner and lashings of mascara. I've also worn it a few times in the day not quite so dark. 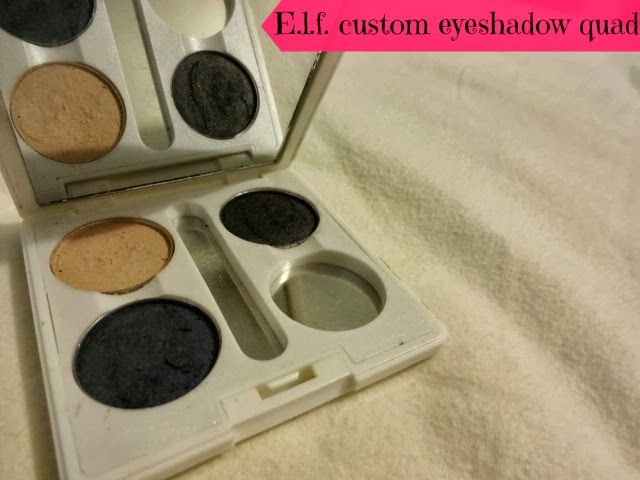 I really do love it and will definitely be looking into more eyeshadows from e.l.f. Custom shadows £1.50 each E.l.f. Wow thats such a great idea if your trying to save. 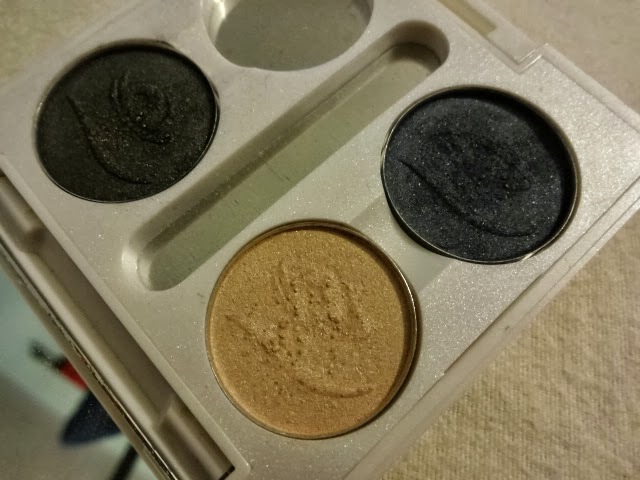 I've also been wanting to make an eyeshadow quad from mac with smokey eye colours but have been put of for a while because of the price, this is a great alternative.